Offering you a complete choice of products which include gas chlorinators for water filtration plants. Gas chlorinators are an economical and effective way of disinfecting the water that makes it safe from water borne diseases. The installation offerings that come along with the chlorinator includes pvc tubing for vacuum supply, moisture trap for chlorine gas, copper tubing, chlorine test kit, non return valve and strainer. 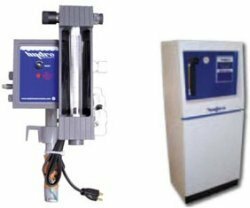 Looking for Gas Chlorinators For Water Filtration Plants ?